Before I explain about Y adaptors I want the readers to be aware that this is just a simplified explanation. Under real conditions at the dock and boat amounts of voltage and amps that can be drawn may fluctuate due to other factors such as tolerances of the circuit breakers. Think of the dock as a pool of amps. A 30 amp 125 volt receptacle on the dock has a 30 amp pool available. The limit to what can be pulled from the dock is the circuit breaker on the dock. Normally in a 30amp 125 volt service it has a 30 amp circuit breaker. Now we do have one more limiting factor. The boat should have a main circuit breaker panel with a main circuit breaker per inlet . These breakers would matching the inlet example would be a 30 amp 125 volt inlet will have a 30 amp circuit breaker limiting the amount of amps the boat can draw from the dock. What a Y cord allows you do to is to pull from this 30 amp pool to your boat. You can have many combinations of amps drawn all adding up to a total of 30 amps or less. So 10 amps to one inlet and 20 to the other inlet or 15 to one and 15 to the other … If the boat tries to draw more than 30 amps from either inlet the 30 amp circuit breakers in the boats will trip. If the boat tries to draw more than 30 amps total between the two inlets the dock 30 amps circuit breaker will trip. Example 25 amps from one inlet and 10 amps from the other inlet 25 amps + 10 amps = 35 amps. The 30 amp circuit breaker will trip at 30 amps. Next lets look at a 50 amp 125 volt dock receptacle and a boat with two 30 amp 125 volt inlets. In this scenario the dock now has a pool of 50 amps with the docks limiting factor being 50 amp circuit breaker on the dock. The boat still has only two 30 amp inlets with the boats limiting factor being the 30 amp circuit breakers in the boat. The Y again will allow you to pull a combination of amps totaling now 50 amps from the pool; However the circuit breakers on the boat will only allow you to pull 30 amps per inlet. So you can have many combinations of amps all adding up to 50 amps or less So you could end up pulling 30 amps to one inlet and 20 to the other or 25 and 25 etc.…… If the boat tries to draw more than 30 amps from either inlet the 30 amp circuit breakers in the boats will trip. If the boat tries to draw more than 50 amps total between the two inlets the dock breaker will trip. Example 30 amps to one inlet and 30 to the other inlet. 30 amps +30 amps = 60 amps the 50 amp circuit breaker on the dock will trip at 50 amps . Another scenario is the 50 amp 125/250 dock receptacle on the dock and a boat with two 30 amp 125 inlets on the boat. This scenario is a little different. The 50 amp 125/250 contains two hot wires each containing 50 amp 125 volts. So in essence two pools of 50 amp. The dock will have a dual circuit breaker each rated 50 amp 125 volts. Again the boat still has only two 30 amp 125 inlets with the boats limiting factor being the 30 amp circuit breakers in the boat. In this case you have two pools of 50 amps . The Y adaptor will allow each 30 amp inlet to pull from one of the pools. The limiting factor being the 30 amp circuit breakers on the boat. . So in this case you can draw 30 amps per inlet or less, but no more than 30 amps as the 30 amp circuit breakers on the boat will trip. With the 2 breakers on the dock being rated 50 amps the main limiting factor falls on to the boats breakers. This set up will allow for the most power to your boat. The male end of the 30 amp 125 volt EEL cord set was made a little thicker than the older style 30 amp cord sets. The 30amp ring currently does not fit over the EEL male end. The ring that does fit over the EEL male end is the 50 amp ring part number 500R. This ring is big enough to go over the EEL male end of the cord and when using the 110R sealing collar it will tighten up and seal the connection. 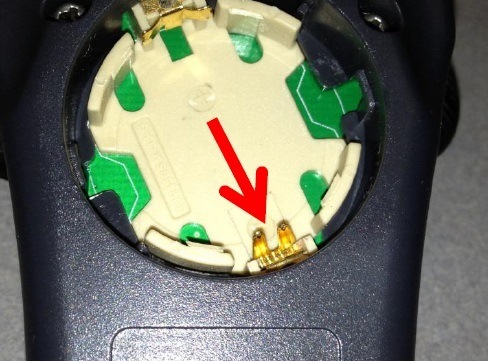 If the handheld remote will not pair with the spotlight, remove the battery cover and the battery. There will be 2 pins on one side of the battery compartment, as shown below. These two pins need to be in contact with the underside the battery. They should not be bent upward, in contact with the side of the battery as shown below. Also, verify that the PLUS symbol (+) or Positive side of the battery is facing up as in the above images. Once the battery is installed properly, follow the instructions below for pairing the remote to the spotlight. 1. Turn off all power to the spotlight. 2. Press and hold the power button on the wireless remote. 3. While pressing the power button apply power to the spotlight. 4. After a few seconds you will hear the relay click and the light will turn on. 5. When the light turns on the paring is complete, release power button. If the handheld remote will not pair with the spotlight, follow the instructions below to verify the spotlight is functioning properly. 2. Connect the yellow and purple wires from the base of the spotlight together. 3. While the yellow and purple wires are connected, apply power to the spotlight. 4. After a few seconds the spotlight will begin to sweep. If the spotlight sweeps, replace the battery in the handheld remote. If the spotlight does not sweep, check all connections to the spotlight. Is there a way to hear an example of what your electric and air horns sound like before I purchase one? We have just recently added to our website the sounds for all of our electric and air horns. The link above will take you to our website and By clicking the play button below the part numbers you can play the horns sound. We have also provided links to images and other info on horns below the sound bars. The Marinco shore power cord connecting the boat to the pedestal sometimes sags or falls into the water. Does it matter that the cord is in the water? Although we have never heard of any incident caused by the submersion of a properly maintained shore power cable, the materials and the design are not intended for underwater use. Good electrical practice is to keep the cable out of the water, and stored out of the weather in a dry location when not in use. The manual for the N20704S N20703S N20703W and N20704W Day and Night Plus Solar Vent says for a hatch installation a spacer ring (N10863SP or N10864SP) is required. I can not find the spacer ring being sold anywhere. With the new vents the spacer ring was not required. The spacer ring was made to fill in the gap between the hatch and the trim ring. It was not used to keep water out or any other reason than to fill the gap. What most people found out was that if you flip the trim ring upside down and slide it up with the flat part towards the hatch the spacer ring was not needed. Due to lack of sales and solution of flipping the trim ring. The spacer ring has been discontinued.